Bentley has introduced the highly exclusive edition of the all-new Mulsanne range, christened as First Edition at the Beijing Auto Show. 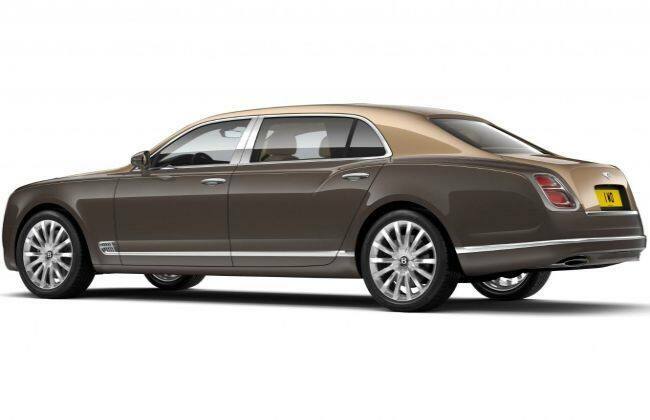 This edition is only limited to 50 cars across all the three models -- Mulsanne, Mulsanne Speed and Mulsanne Extended Wheelbase. One of the highlight of this edition is the 350-year-old English walnut tree wood embedded at various places in the car which was “fetched at an undisclosed record price at auction”. Bentley was able to acquire enough to create veneer panels for a small number of cars. Other Mulsanne First Editions will be available with a unique Antique Ash veneer, which we assume is also some kind of very expensive wood. The “First Edition” features sterling silver vanity kit placed in the rear picnic table. This vanity kit includes a vanity mirror, hairbrush and a comb. What use this might be to the lady or gentleman sitting at the back seat of a Mulsanne is a debatable topic, but the preparedness for a bad hair-do has never hurt anyone. The car features First Edition badges all over the car like embroidery on the seats, a specially engraved Bentley ‘Flying B’ bonnet ornament and near the door sill plates. Bentley claim that the Mulsanne Extended Wheelbase offers a ‘first-class air-travel experience’. The car has an additional 250 mm of rear legroom than the standard model. The air-travel experience is courtesy of the reclining seats with extending footrests, a rear compartment sunroof and compartment curtains, which in the First Edition are specified in a new Ivory colour to match the interior. Being rear passenger focused, the car features Bentley Entertainment Tablets – a pair of 10.2” Android devices (with 4G, WiFi and Bluetooth) placed at the backs of the front seats. They feature a Bentley-specific interface, and have 32GB of on-board storage (expandable to 128GB via a Micro-SDXC card), USB ports and a front-facing camera. We don't doubt the words of Mr. Dürheimer as this First Edition is indeed among the pinnacles of automotive luxury. Though it is difficult to find buyers of this car in India, we will be very proud in case one of these cars ends up on Indian roads. World's Fastest Ultra-Luxury Saloon - Bentley Mulsanne Speed!